Straight out of Lake City comes a fantastic 5.56x45mm round that your AR-15 will just eat up like it's candy. Great reliability, smooth feeding and easy on the wallet, this 55 grain lead core XM193 5.56x45mm ammo is just the round you've been looking for. All rounds are brass-cased, non-corrosive boxer-primed and reloadable. All worked very well with no issues at all through 600 rounds. Accuracy was just fine! Definitely a keeper -- add this to your stash! No issue with this ammo -- great deal and excellent service! Won't buy ammo from anywhere else! No problems with the first 100 rounds of 500. Fired with accuracy at 200 yard 8" steel with more hits than misses. Great ammo, great deal and great company. Will reorder soon but more this time around. I should have stocked up my ammo when ordering but hopefully another good sale coming soon. Highly recommend to all shooters. Shot all 500. No problems what so ever. Fast shipping and price is right. Will be using Ammoman again. I was really happy with the response and good product. Shot some 5.56 from my sig mcx today. (Switched out 300 BO barrel). The ammo was flawless. Will be back for more. Great ammo! I shoot it regularly in my Rock River, Stag and Colt with not one problem, ever. great service too Ammoman! Ammo shot great. Fast delivery. Would definitely purchase again. 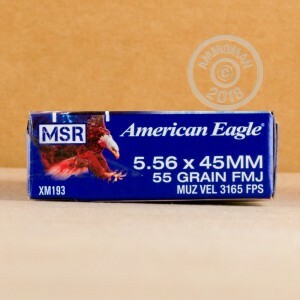 Good clean ammo at a good price. 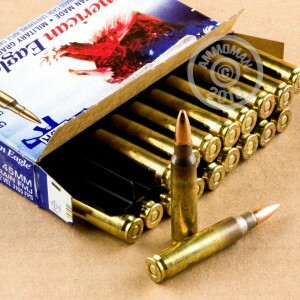 Good accurate, clean ammo at a good price. Thanks!!! Super stuff, good price, lightning fast free shipping and no tax....SOLD! !